Diminish the signs of premature ageing with Ageless Actives. It contains powerful healthy substances such as CoQ10, Reservatrol, vitamin D3, adaptogens, botanicals and antioxidants to help provide you with a healthier brain, liver, heart and kidneys. Ageless Actives was created as a total body health supplement to help diminish signs of ageing and improve your overall health. Use as part of the Complete Essentials with IsaGenesis pack for best results. With people spending more time indoors, using sunblock extensively and being more cautious about skin cancer many people are deficient in vitamin D3. 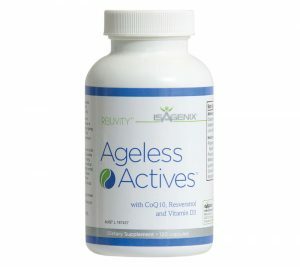 One dose of Ageless Actives contains 1,000IU of Vitamin D3. Each dose of ageless Actives also contains 250mg of Reservatrol which helps fight free radicals in the body, 160 glasses of red wine would be the equivalent which we do not recommend at IsaElite. The business aspect to Isagenix is completely optional. For those of you wanting to live a healthy lifestyle and take advantage of this fantastic opportunity keep reading.